The opening month of the 2012/13 campaign saw Dynamo Kiev win 7 games out of 7. In 6 of those 7 games the winning goal was scored by in-form forward Brown Ideye, whose personal tally now stands at 8. Almost equally impressive as that record is the times at which he’s scored; 4 goals in injury time and another with just 4 minutes remaining. Crucial goals at critical times. Here, Joe Kennedy takes a look at Ideye’s footballing journey so far, what sets him apart from other strikers and how far he can go. Fittingly for a man of many goals, Brown Ideye is a man of many celebrations. Occasionally he opts for a routine of backflips, sometimes he performs an ensemble with his Nigerian compatriots and he’s previously paid tribute to the famous celebrations of Bebeto and Yekini at the 1994 World Cup, giving his own renditions. However, upon sending Ukrainian giants Dynamo Kiev a step closer to the Champions League, he performed an altogether rather different celebration. In the 6th minute of 5 added on, having just rifled the ball high into the Feyenoord net, Ideye reeled away towards the corner flag and, with arms stretched wide, he launched himself into a slide. Leaning back, he looked up into the stands before him and then into the skies above. On the walk back to his own half, fists clenched tight, he let out an almighty yell of adrenaline-fuelled pleasure. You may be thinking ‘That’s the kind of celebration I see every other week’, and you’d be right, but it’s in its relative normality that this celebration stands out. His putting aside the light hearted fun and giving over to pure emotion gave a great picture of just how much this meant to him, it illustrated a maturing man, hungry for success and determined to achieve it. But just how far can he go? Perhaps the best place to start looking for answers is at the beginning of Ideye’s life in football. Born in Lagos, he grew up playing for youth sides of Bayelsa United before moving on to rivals Ocean Boys. Whilst there, he won the league in his first season. Ideye’s willingness to put his career before club rivalries hints at the ambition of the player. Ambition that served him well, for his time with Ocean Boys earned him a shot with the Nigerian under 20’s team and move to Swiss outfit Neuchâtel Xamax. It’s worth noting that prior to his move to Xamax, Ideye failed a trial at Dutch side Willem II; a knock that may have affected a weaker-willed player’s confidence, but not Ideye’s. After early struggles adapting – “The first two weeks were really hard. Compared with warm Africa, in Switzerland I felt like in the Arctic.” – Ideye’s strong character prevailed: “But I immediately threw all nonsense out of my head, not nostalgic, but rather to concentrate on football.” It was that attitude that helped him quickly become one of the league’s most feared forwards, scoring 23 goals in 55 games over his 2 year spell at the club, a scoring record that attracted attention from around Europe. Ideye’s most persistent admirers were just an hour and a half’s drive away across the French border, FC Sochaux. Having scored 12 goals in 17 games throughout the first half of the 2009/10 season for Xamax, Ideye made the move in January. A brace in his first cup game was a promising start, but he failed to reflect that form in the league, scoring just twice in his 17 starts throughout the latter half of the season. Again though, Ideye persevered and his second season saw a much better return, 15 Ligue 1 goals and another couple in the cup attracted more attention, this time from some bigger boys. 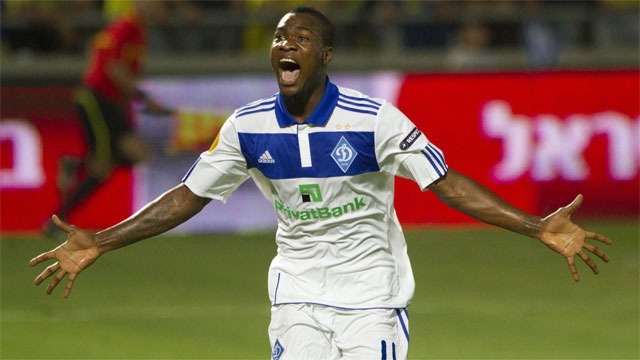 In June 2011, Ideye completed a €9M move to Dynamo Kiev. Unlike at previous clubs, Ideye settled straight in, coming off the bench in his first game he netted a brace which earned him a place in the starting line up. He repaid that faith by scoring another brace straight away. Twelve league goals and a couple in the Europa was a respectable return for his first season, but this year he wants more; after the 8 goal start he’s already had, he looks sure to get it. An accomplished striker of the ball with both feet, Brown Ideye is a threat from anywhere in and around the penalty area. His finishing often isn’t so much artistic as it is efficient, but efficient it certainly is. Powerfully built with a low centre of gravity, he loves to run at defenders, his maximum technical ability may not be particularly outstanding, but his ability to balance a high level of pace and power with what technical ability he does possess is impressive. Ideye doesn’t require space to be effective, though, he’s happy to receive with his back to goal and create an opening himself and is an expert poacher should a chance fall in a crowded box. Despite standing at just 5’11”, Ideye’s major strength perhaps lies in his aerial ability. His intelligent runs are beneficial to play along the ground but seemingly more so in the air; the ghost-like manner in which he evades defenders often leaving him with a simple nod past a helpless keeper. As with space to run into when on the ball, freedom in the air is a benefit for Ideye, not a prerequisite; his power affording him an ability to leap high and soar – like the Super Eagle that he is – challenging defenders with an extra few inches height advantage. Having continued to improve year on year it’s hard to say just how far Ideye can go. At 23 he could well further improve for some years to come, but ,based on his game at its peak, he looks set to at least achieve more than he currently has done. His second season at each club in Europe thus far has seen him add consistency to his league performances, doing so this year could make the difference for Dynamo in the title race. Another step Ideye must aim to take is improving his performances for the national team. He may be out of favour now, but performances like those he’s given at the start of this season will be sure to turn heads and should afford him further opportunities. The biggest opportunity Ideye has in the near future is in the Champions League, now widely considered to be the pinnacle of world football. His goals have put Dynamo one step away from the group stage and he’ll be called upon again to help make that step, but in Borussia Monchengladbach, Dynamo have tough opposition to beat. If Ideye has a strong desire to progress to the very highest level of European football he may need to work more on the creative side of his game; furthering his ability to link play as well as score goals. He’ll also need to prove himself consistently in Ukraine to ignite interest in his signature from the kind of clubs that higher level would comprise of. His current contract lasts another 4 seasons, but if he has confidence in his ability to make it in a better league it seems unlikely that he’ll see out the full term. Ideye’s hard working attitude and dedication to his career give him a great foundation, whether the maturity he’s gaining and improvements to his already impressive game will take him where he wants to go remains to be seen.